← Web Roundup: How Do You Feel Today? Myers explores what recovery-oriented care looks like at Horizons, a rehabilitation organization serving over six thousand “members” (mental health care service users) throughout a large city. Horizons’ new CEO upsets the organization’s status quo by hiring “peers,” individuals with lived experience of mental illness, to spearhead Horizons’ recovery-oriented restructuring. Enter Vera, the feisty and passionate “person in recovery” who is tasked with running Horizons’ first peer-led treatment program, the Peer Empowerment Program (PEP). Vera is a constant, guiding presence throughout Myers’s book, alerting Myers to the daily indignities that members suffer and demonstrating what truly empathetic care looks like. She has a knack for connecting with the most downtrodden, frustrated, angry, and seemingly hopeless individuals who come through PEP’s doors. “Treat people like a person,” she tells Myers, “and they will become one” (75). Moral agency is the theoretical crux of Myers’s argument, a term she borrows from bioethicist Erika Blacksher’s (2002) research on poverty’s effects on sense of self. Invoking the work of Blacksher, Arthur Kleinman, and Angela Garcia, Myers defines moral agency as “a person’s freedom to aspire to a ‘good life’ in a way that leads to intimate connections to others” (13). Horizons’ (and other agencies’) vision of recovery is such that moral agency is bestowed only after members have (1) become rational, (2) become autonomous, and (3) become hardworking. For a marginalized, stigmatized, destitute population caught in a mental health care system that dis-incentivizes work (make too much money, and risk losing disability benefits), these are impossibly high standards. And because the focus is on work rather than on building sustainable relationships outside of the mental health care system, members often find themselves going the journey alone. Myers’s contention is that intimate relationships, much like the unconditional acceptance Vera offers (although Vera, too, believes in the socially restorative power of work), must come first for members to have any chance of succeeding in their recovery journey. The chasm between Horizons’ recovery philosophy and the reality of members’ everyday struggles becomes evident as Myers maps out the three steps of the recovery journey ethnographically (Step 1: Take Your Medications. Step 2: Self-Advocate. Step 3: Work for Intimacy). Perhaps the most poignant story is that of Maison, a gregarious Korean War veteran and amateur blues singer who is Horizons’ “show pony of recovery” (58). After years of stability, sobriety, and devout adherence to taking his medication (Step 1), Maison suffers a relapse of his mental illness. In quick succession, he loses his Horizons housing and his role in the community. Myers argues that Maison’s lack of moral agency precipitated his rapid decline: “When he began to have trouble, there was no safety net for him, no intimate web of connections to catch him as he fell. Besides staff, no one outside of Horizons seemed to know he existed, except me” (85). Maison enjoyed an active and valued role at Horizons as long as he remained in recovery, but his relapse reveals the contingent nature of these clinic-based relationships, leaving him socially and emotionally abandoned when he falters. The takeaway is that although Horizons’ efforts (and those of the American mental health care system writ large) to provide recovery-oriented care are well intentioned, adherence to the current model of recovery, a model that does not foreground moral agency, only sets its members up to fail. There is hope, however, and in the final chapter Myers briefly describes what successful recovery-oriented care can look like—care that extends beyond the current “edge” of recovery-oriented services offered. Myers makes an impassioned plea for service providers to meet service users at their level, drawing on Annemarie Mol’s concept of “the logic of care” to encourage attention to living with, rather than recovering from, serious mental illness (157-158). Myers suggests that a critical reframing of what recovery means may provide an alternative, and ultimately more successful, approach to offering recovery-oriented care. She proffers her own three-step alternative to the current recovery model: Step 1: Gain moral agency (which requires providing people with resources and opportunities to become valued members of their local communities). Step 2: Form intimate relationships. Step 3: Engage in “work” (any activity that is personally meaningful). Myers’s writing is notable for its literary quality, and she does an admirable job of interweaving research literature and ethnographic artistry. Rather than presenting a chronologically linear narrative arc, the stories (often mere snippets rather than complete tales) ricochet in time and space, a rhetorical maneuver that seems to mimic the fragmented and chaotic existence of Horizons members. Myers writes of PEP, “And the people kept coming—in and out, out and in, an endless tide” (31)—and so, too, do people flow in and out of focus throughout her book, with Vera at the center as a beacon of recovery-oriented philosophy and care. This approach captures the precarious circumstances, both material and psychological, in which members live; they are in imminent danger of losing their minds, their possessions, and their support systems. Myers draws heavily on clinical and social psychiatric literature to contextualize the ethnography—her book provides an excellent summary of over a decade’s worth of major perspectives in psychiatry—and engages less with conversations in anthropology. Moral agency, despite its centrality to Myers’s argument, is a concept deployed without much attention to its anthropological or philosophical lineage, and only in the final few pages does Myers expand on the brief definition offered at the outset (and quoted above). Moral agency and intimacy suffer conceptual slippage; oftentimes the two seem interchangeable, and intimacy, a complex phenomenon in its own right, is never unpacked. And while Horizons members are presumably the agents at the center of moral agency, moral agency is more often than not described as a characteristic bestowed upon them by others (primarily, staff), not a quality they seem capable of generating by themselves. But perhaps that is the point, at least at Horizons, where recovery-oriented care lacks the imagination and resources necessary to assist profoundly disadvantaged and disabled individuals in combating “the demoralization, misrecognition, existential crises, and catastrophic conditions of everyday survival” (156). It is Myers’s heartbreaking descriptions of those conditions as experienced by the members she befriends that make this book so valuable. While specialist readers may yearn for more theoretical thickness, non-specialists will appreciate its vivid descriptions and vibrant characters, which showcase the value of long-term, in-depth ethnographic research. With compelling writing that appeals to a general audience, this book is essential reading for anyone with an interest in social justice and the American mental health care system. Ellen Rubinstein is an anthropologist and Postdoctoral Fellow in the Department of Family Medicine and Community Health at Rutgers Robert Wood Johnson Medical School. Her research explores caregivers’ conceptualizations of mental illness in the U.S. and Japan. Rubinstein E. Neely Laurenzo Myers’ Recovery’s Edge: An Ethnography of Mental Health Care and Moral Agency. Somatosphere. 2016. Available at: http://somatosphere.net/2016/neely-laurenzo-myers-recoverys-edge-an-ethnography-of-mental-health-care-and-moral-agency.html/. Accessed April 24, 2019. Rubinstein, Ellen. 2016. 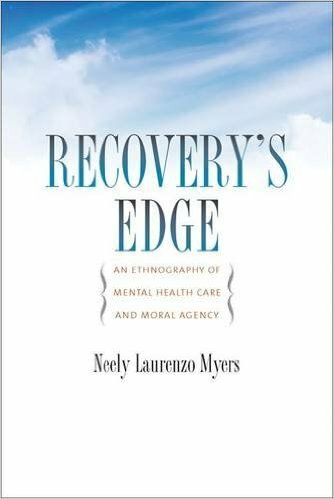 Neely Laurenzo Myers’ Recovery’s Edge: An Ethnography of Mental Health Care and Moral Agency. Somatosphere. http://somatosphere.net/2016/neely-laurenzo-myers-recoverys-edge-an-ethnography-of-mental-health-care-and-moral-agency.html/ (accessed April 24, 2019).